The Nikon Coolpix AW110 is an all-weather, all-purpose digital compact camera featuring a robust exterior that is water, shock and freeze-proof. It also sports built-in GPS, a back-illuminated 16 megapixel sensor, EXPEED C2 processor and FullHD video recording. It's a camera for the outside photographer or gap year student on a travelling expedition. Priced at £279 / $349, the AW110 is available in blue, black, red and camouflage. The Nikon Coolpix AW110 follows on the All Weather tradition in terms of styling. It's a chunky unit, thanks to the tough exterior that protects against the elements. The lens has been positioned in the top corner, which seems to be a preferred spot for Nikon designers when designating the area to put the hole. The brightly coloured front (at least in the case of the red or blue versions) is a metal surface with glossy paint finish. That's all you see, though, because thick plastic takes over the rest of the camera to not only protect the camera, but also give an appearance of being tough. On the right side of the camera is where you put the memory card and battery. It's easily identifiable thanks to the huge locking wheel in place to keep the area moisture free. To open it, you have to twist it with your thumb and forefinger while pressing the central button with your index finger. Or use two hands. 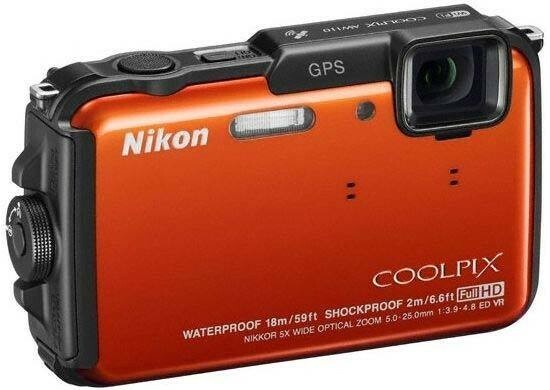 The Nikon Coolpix AW110 is certainly designed for the travelling photographer. There are a number of features that have been installed to help you along the way if you're doing just that. The AW110 has a built-in GPS (Global Positioning System) so you can keep track of where you take your pictures. Switching it on is done by pressing the button on the side of the camera. It only works if you input the correct time and date into the camera and it uses the time from the EXIF data to correlate with the time on the GPS. So when you take a picture at 4pm, the camera looks at where the GPS says it was at 4pm and links the information together. You can then upload the picture with that information onto Google Maps for friends and family to see. There's also a World Map display that will document your journey for you to see on the camera. To help you upload the pictures sooner and share faster, the AW110 comes wifi enabled. This means that when you have a smart device (phone or tablet) nearby, you can pair it by using the Nikon app and transfer pictures via that. The Nikon Coolpix AW110 has a resolution of 16 megapixels which sit on a back-illuminated sensor. These type of sensors have the circuitry placed on the back of the camera. It's normally on the front and slightly blocks each pixel making them less responsive to light. Back-illuminated sensors should have the opposite effect and be more responsive to light. Previous encounters with this technology haven't been positive for us, but we hold out hope for the AW110. To increase the chances of getting a blur free photograph, the AW110 has a number of features in place to get that shot. What Nikon calls its Anti-blur technology is a mixture of features such as Hybrid VR (Vibration Reduction), High ISO (essentially ruins the image quality, but you get the shot) and the Best Shot Selector which takes a series of photographs and chooses the best out of the bunch to keep. One other interesting feature on the Nikon Coolpix AW110 is the Altimeter. It's a small scale on the left side of the screen that tells you how high above sea level you are. It has a range of -300 – 4,500m and when you go underwater, it has a Hydro-barometer which can measure your depth up to 20m. Now this is a very important feature, because all current and previous underwater cameras don't tell you when you're reaching the tolerance levels of the waterproofing. This way, there's no chance of going too deep by accident. Couple that with the GPS and the robust build quality of the camera such as 18m waterproofing and 2m shock-proofing and it's a camera that extreme sports enthusiasts will be interested in. Press the green camera button and you open up the mode options. There are five shooting modes you can put the camera into. Which one you choose will be dependent on how much control you want to hand over to the camera. Let's make no mistake about it, there's no option for you to take full control. However, there is an option to lose all primary control except pointing, zooming and shooting. It's the first mode in the list which is denoted by a camera with a heart. It's called Easy Auto mode and when you hold the camera up to the scene you want to photograph, it analyses what's in the frame and selects the appropriate scene mode to get the best results. Keeping in the vein of handing over control, the next option is the Scenes mode, although you get to choose which one you want to use. There's a number of filters you can use such as Soft, Sepia, Mono, High-key, Low-key and Selective colour. If you're taking pictures of people, there's the Smart portrait option which works in the same way as the Easy Auto but also adds the beauty tool to improve skin flaws. Finally, there's the Auto mode at the bottom which gives you the most control out of them all. In the Main menu, you have four sections listed down the left side for Shooting, Video, GPS and Set-up. The screen is split into three columns and the central column will be default highlighted. You can press left to scroll through the four sections or right to enter the sub-menu of the option you're highlighting. There are a number of continuous shooting modes and what you're photographing will determine the mode you select. In Continuous H, we took six images at roughly one every 1/100sec. The camera stops after six pictures and takes a further 12 seconds to download from the buffer to the memory card. The pictures are recorded at full resolution, though. In Continuous L we shot 19 pictures within a ten second time frame which averages out at 1.9fps (frames per second). The camera still records at full resolution, but takes over a minute to complete downloading to a class 6 memory card. Pre-shooting cache mode takes a burst of 25 pictures in two seconds, but they're recorded at 1 megapixel. There's also a high speed 120fps and 60fps shooting mode which record at 300,000 pixels. They're great for super fast action as long as you have no intention of printing them up or zooming in to see detail on a computer. Start up from cold is around 1.5sec. Or that's the fastest we could do it. We suspect that it's actually a bit faster, but the Nikon Coolpix AW110 won't focus while it's performing its start up tasks. There's no indication when it's done, so its trial and error. It would only be the difference of a few microseconds and even 1.5sec is faster than many digital compact cameras by around 1sec. You can access the playback function of the Nikon Coolpix AW110 regardless of whether it's switched on or off. If it's off, you have to hold the button down for a few seconds so that it knows you've not caught it accidentally. Otherwise it's just a firm push. The images will come up full screen with the option of adding effects by pressing ok. The information on the screen will disappear after a few seconds, but you can still press ok to enter the Digital Effects screen. Press the Menu button and the Playback menu replaces the Shooting and Video menus. GPS and Set-up remain. In this section, you can retouch the images again, add D-Lighting which is a type of dynamic range boost. You can also protect pictures to avoid them getting deleted by mistake, rotate them, add audio among other things. Upon opening the box, you'll find a thick booklet which is a Quick Start Guide. It looks substantial, but is in fact in several languages. The full manual is on the enclosed CD which also holds a basic editing and tagging program ViewNX 2. Beneath the camera and lithium ion battery, there's a charging unit, video cable, USB cable and long strap. There's also a filter holder for if you decide to purchase any additional filters and a brush for cleaning the unit of dirt once it's dry.